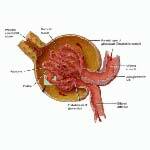 The symptoms of pauci immune glomerulonephritis are similar to the symptoms of kidney disease. Some of these include foamy urine, protein in the urine and fatigue. These symptoms are similar to those of membranous glomerulonephritis and fibrillary glomerulonephritis. Treatments of pauci immune glomerulonephritis are aimed at decreasing the inflammation of the first level of the glomerulus with the goal of stopping the deterioration of the filtering unit. Many times corticosteroids have been used for pauci immune glomerulonephritis. These are non-specific anti-inflammatory agents and affect many of the tissues within the body. Some of the side effects of the corticosteroids include weight gain, hyperglycemia, agitation and the destruction of the bones as well as bruising and thinning of the skin. If you notice any of these side effects, be sure to contact your physician immediately. In addition to your treatment, there are some things that you can do to maintain your health. You can follow a kidney disease diet consisting of low fat and low salt foods. This will help to keep your blood pressure under control, thus helping to slow the progression of this disorder. No matter what you will want to be an integral part of your diagnosis and treatment. If you are healthier, otherwise, you will be able to live a pretty normal life. Because there is no cure for this disorder, eventually you will experience glomerulonephritis renal failure. You will want to discuss the possibility of dialysis or kidney transplant.